When Winter begins, the water horses leave the stormy sea and go on land on Thisby. 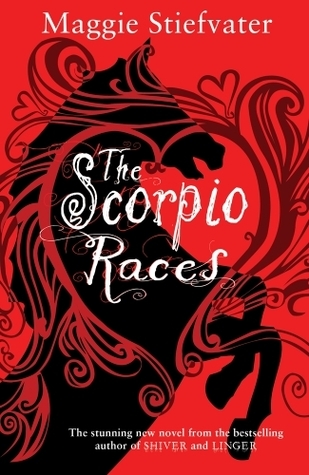 It is the sign for the most dangerous race of all to begin: The Scorpio Races, run not on normal horses, but on the fierce, dangerous and deadly water horses. Kate Connolly, called Puck, has lost her parents to these creatures and will soon loose her brother to the mainland and her house to debts owed to Benjamin Malvern. Sean Kendrick, working for Malvern and four time race winner, wishes for nothing more than to finally call Corr, the red water horse he rides, his own. When Kate decides to join the races on her horse, she encounters obstacles around every corner. She also meets Sean. In their own way, both of them are outsiders and they get closer as the race draws nearer. I loved the atmosphere of the novel. I really felt myself transported to a small island, surrounded by a wild sea. The atmosphere is both grim and desolate and mystical and alluring. It is a contrast that the island Thisby has on its inhabitants as well and it is beautifully captured in the book. Even under the brightest sun, the frigid autumn sea is all the colours of the night: dark blue and black and brown. I watch the ever-changing patterns in the sand as it’s pummelled by countless hooves. I also really liked Puck. I loved the fact that she is not a nice, charming girl. Her go-to face is scowling. She doesn’t let people get close to her easily. She can be rude and off-putting and has no fear of using biting remarks to those who deserve it. I also liked the way she is, underneath her prickly exterior, very caring and loyal. Her love for those close to her and for her island shows itself in small things. A lot of the time it was small, sweet sentences where the book really shone. She is my mare and my best friend, and I keep waiting for something bad to happen to her, because I love her too much. I also thought Mutt Malvern was a very good antagonist. I hated his guts. I kept hoping someone would punch him. He was creepy and scary and psychopathic. Every time he appeared he made me nervous because I didn’t trust him and didn’t know what he would do next. A very well rendered antagonist. For the first time in nine years, I lock the door to my flat, thinking of Mutt Malvern’s purple face and fisted hands. I really liked the secondary characters as well. Peg, the butcher’s wife and Dory and her sisters were characters I would have liked to read more about. Unfortunately, they remained a bit vague. What I disliked most about the book was the permeating feeling of vagueness. It started out when, in the beginning, it was difficult to pin down a timeframe the novel took place. I sort of thought it was a setting somewhere before the First World War, but I wasn’t sure. Sometimes things would be described that had me feeling it had to be earlier, sometimes I thought it was later. Only in the last pages of the book it gets easier, with the suffragette movement being mentioned. Another thing that remained vague and hard to pin down was how old Puck was. We get her thoughts and other’s reactions to her and it was very confusing. I had her pegged as around sixteen in the beginning, but often her thoughts and the way others treated her had her look much, much younger. Part of me thinks he’s just humouring me, a kid, him most of the way to man, but then part of me sees my hands in front of me. They’re Mum’s hands, not a little girl’s hands, and I know I’m wearing Mum’s face, too. I wonder how long it will take for me to feel as adult inside as I look outside. The vagueness also stretched to the relationship between Sean and Puck. The result was that I didn’t really feel any chemistry between them. Definitely not as lovers. I felt the beginning of a friendship, but it was all very vague until suddenly they are in love. In some ways, the vagueness contributed to the atmosphere of the island, but often I would have liked a few passages where things were made clearer. For a long time, due to the vagueness, I didn’t understand at all what Puck saw in Sean. Towards the end, there is a very sweet dinner scene where I finally got it. I would have liked more of that. I also wish Puck had friends, especially female friends. It was another reason she was hard to pin down. She hangs around with her brothers, but doesn’t really have any friends. There is Peg, the butcher’s wife and Dory, who runs a shop with her two sisters, but they are older than Puck. However, I definitely would have liked to know more about them. It was a good book with very sweet moments. However, it left me with a distinct feeling of vagueness.